With equities managing to hold moderate gains, the VIX was in cooling mode, settling -0.9% @ 15.06. Near term outlook is for a further wave lower to the sp'2065/60 zone.. which will probably equate to VIX maxing out in the 16.50/17.00 zone. The 20s look well out of range. VIX remains relatively subdued... the 20s are very unlikely in the current up wave. US equities settled moderately higher, sp +8pts @ 2079. The two leaders - Trans/R2K, settled higher by 0.2% and 0.5% respectively. Near term outlook offers high probability of one further wave lower to the 50dma in the low sp'2060s. From there.. the broader upward trend will likely resume. A pretty tedious day... a bounce day, much like last Wed/Thursday. Market looks set for a fifth minor wave lower.. to around 2065/60. Considering the underlying upward pressure, that final low might be dragged out until Wednesday. With AAPL turning red (ohh the humanity!)... 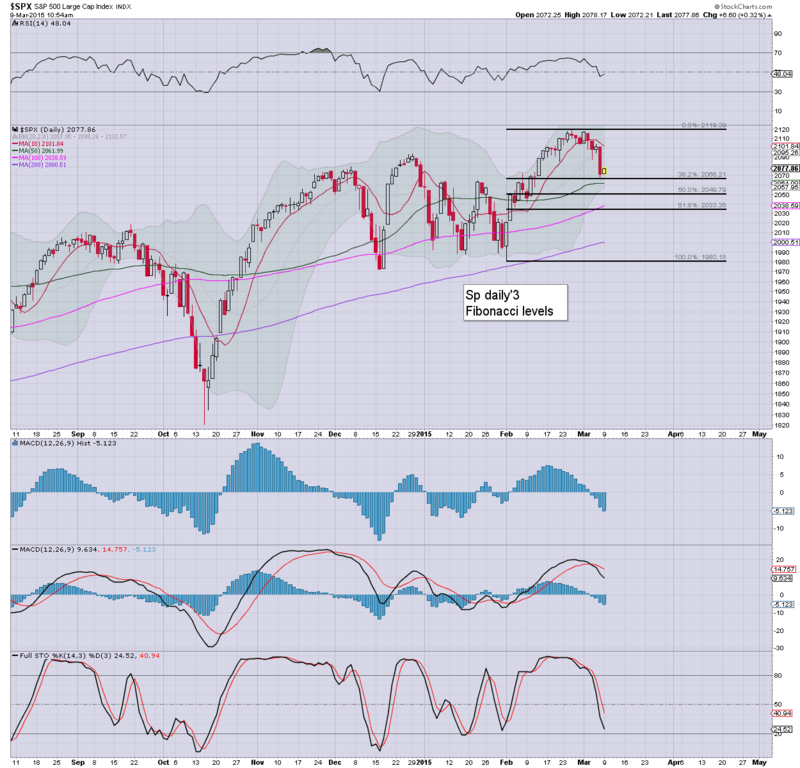 the broader market is looking similarly vulnerable. Price structure is a clear bear flag.. equity bears should be content with any daily close <sp'2080. Metals remain weak, Gold +$2. Oil is slowly cooling from earlier gains, +0.7%. ... suffice to say... with AAPL turning red... the momo chasers have a real problem across the next day or two. Holding to primary downside target of the 50dma. 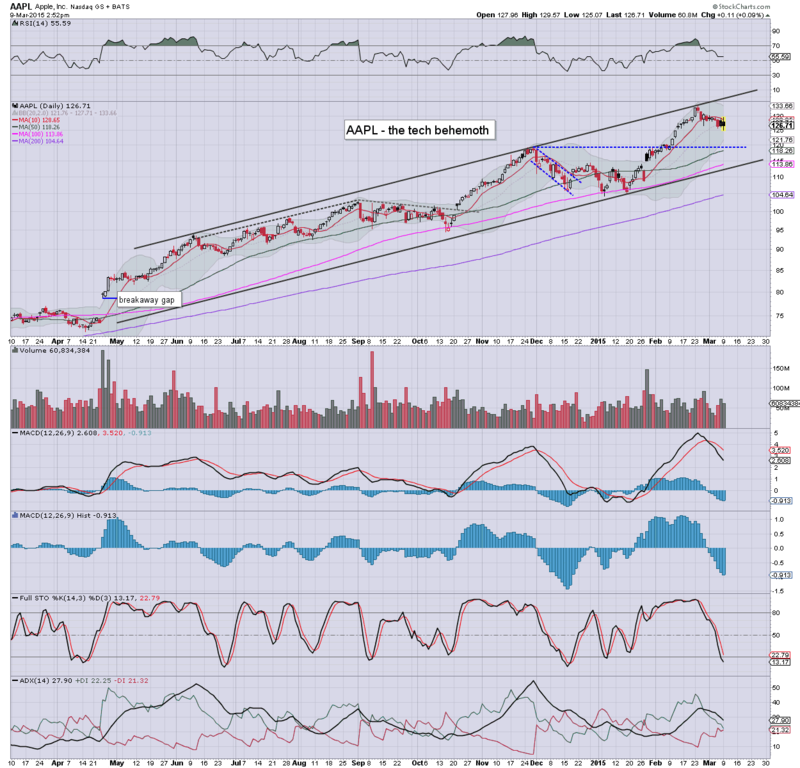 The mild hysteria in AAPL (+2.0%) is helping the market build further gains into the mid sp'2080s. Regardless, price structure remains a clear bear flag, and the 2067 low still looks set to fail.. but clearly not today. Metals look vulnerable, Gold +$2. Oil is cooling from earlier gains, +0.8%. A rather classic rebound day from the big Friday decline... but yes.. I'm calling it a bounce. As things are... a daily net gain looks highly probable, to be followed with a new cycle low.. whether tomorrow.. or Wednesday. .. the horror continues.. .especially when seen on the bigger weekly cycle. 2.30pm.. its typical turn time... equity bears need a daily close <2080 to break the bear flag... and open the door to 2065/50 zone within a day or two. US equities are holding bounce gains, and should get no higher than the sp'2080/85 zone. Regardless of the rest of today, a break under the Friday low of 2067 looks relatively easy.. and should equate to VIX 16/17s. Metals remain weak, Gold +$2... with miners continuing to see sig' declines, GDX -3.1%. Little to add. Its getting somewhat tedious again... ahead of the next wave lower. 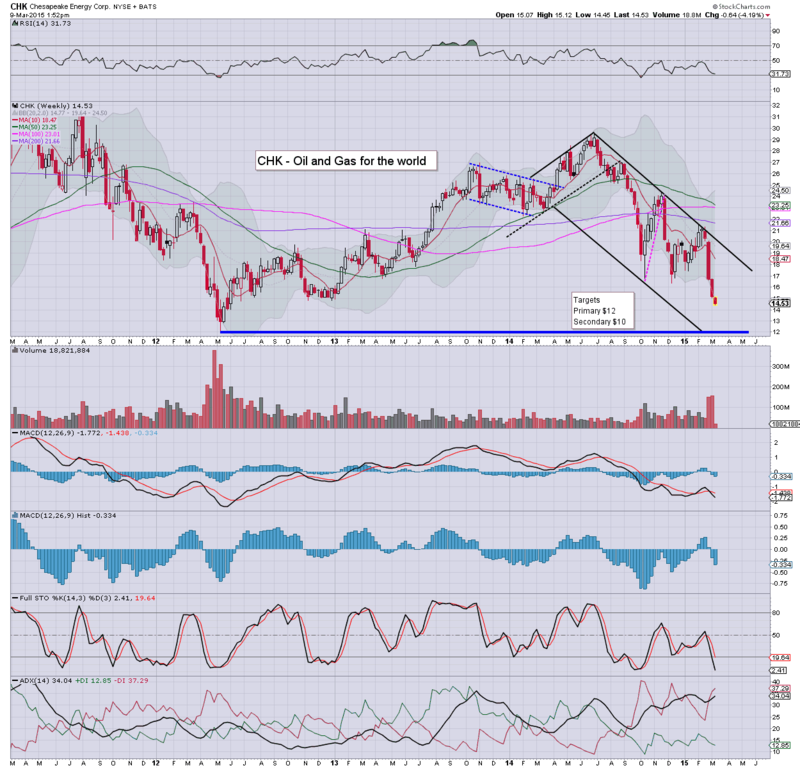 A major failure to hold the floor.... next core support... a long way down in the 10/9 zone. US equities continue to slowly build moderate gains, but it remains a minor retrace of the sig' Friday decline. VIX is reflecting a market that is set for another wave lower to at least test the 50dma in the sp'2062/61 zone. 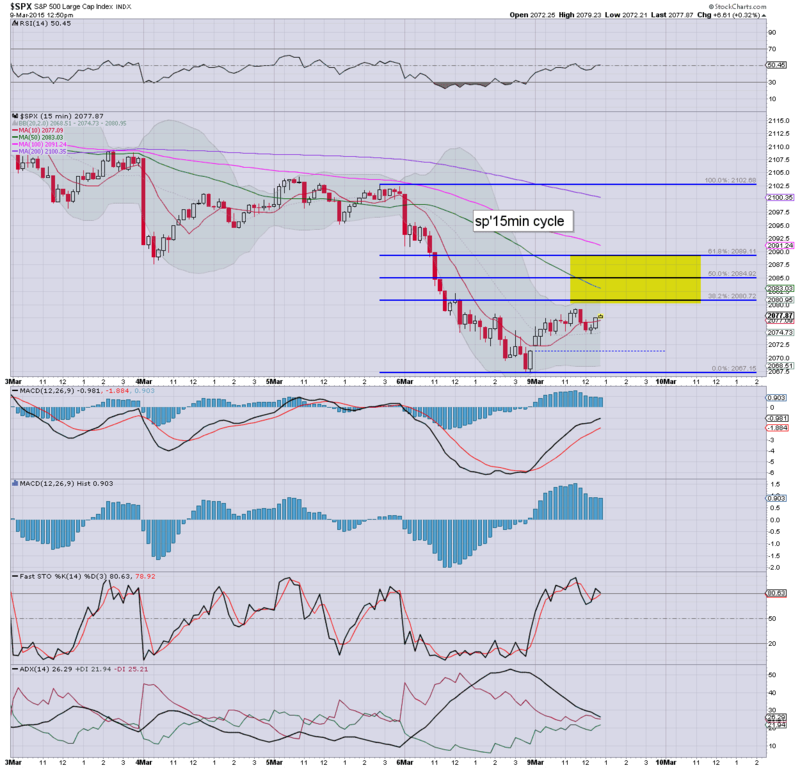 Metals are cooling from opening gains, Gold +$2... set for far lower levels in the days.. and weeks ahead. 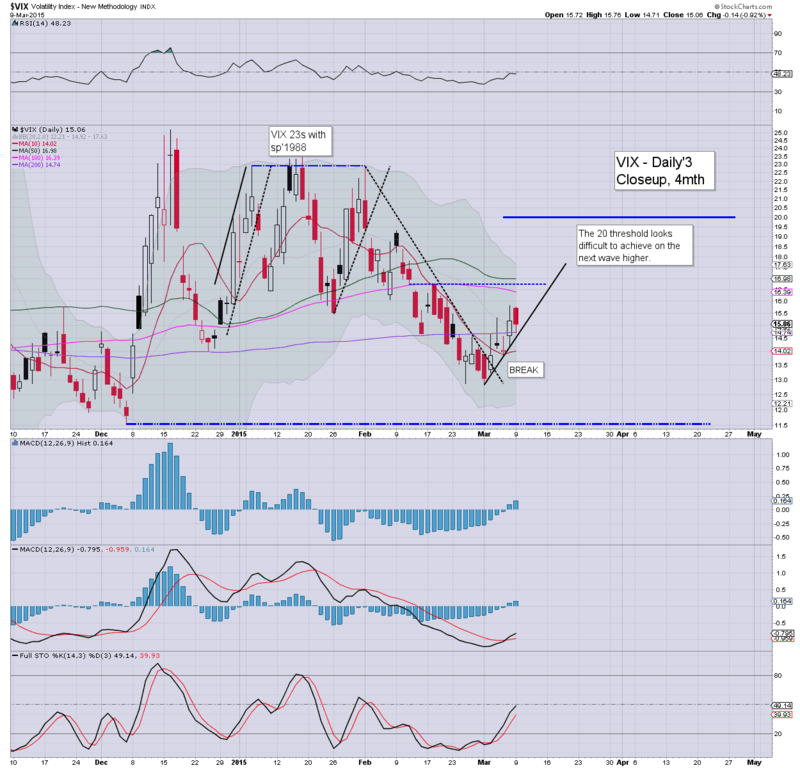 *notable opening black-fail candle on the VIX, but looks set for another wave higher to at least 16.50. Suffice to say... it is VERY likely a bear flag... with another wave lower due. That might begin late today... or early tomorrow... it really makes little difference. time for an early lunch. US equities are battling to build gains, but price structure is arguably just another bear flag. 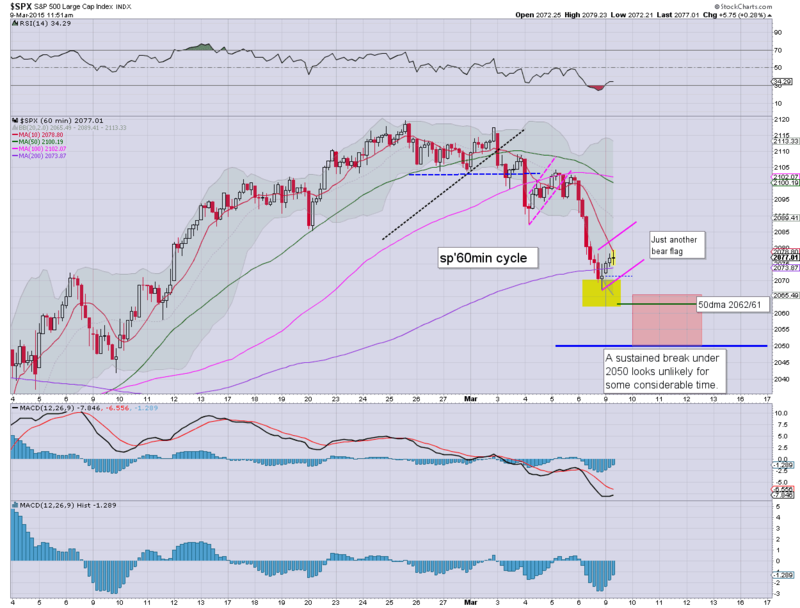 A break of the Friday low of sp'2067 looks due... whether late today.. or more likely tomorrow. VIX is notably holding fractional gains in the 15s. 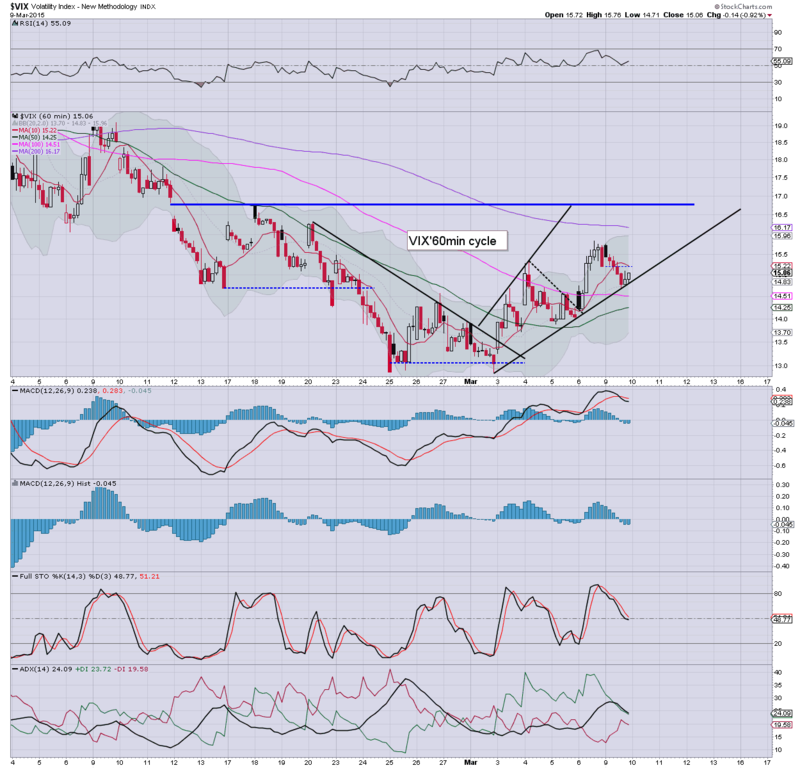 Oil has built sig' gains of 1.6%.. but like the metals... remains vulnerable. All things considered.. this mornings gains are just a bounce. 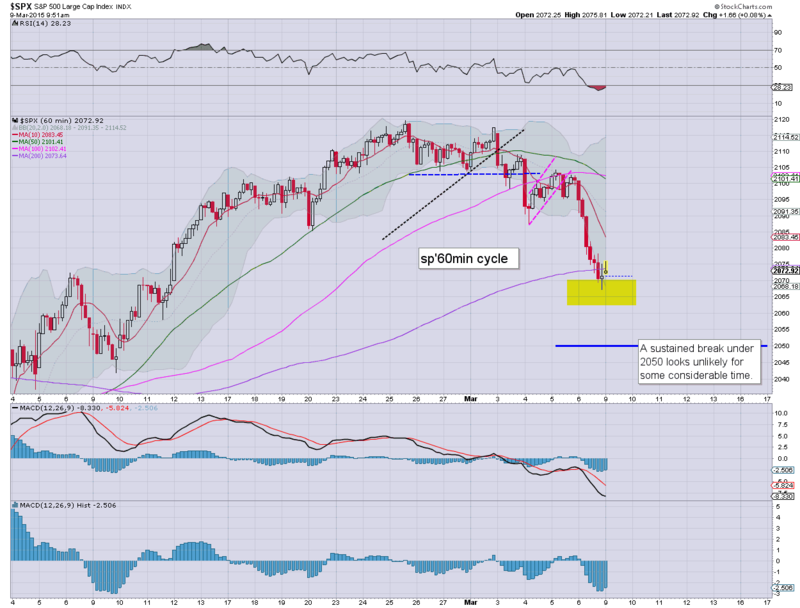 It doesn't make much sense for 2067 to be a key low. Best guess.. a hit of the 50dma.... before first real opportunity of renewed broader upside. Notable weakness: AA -4.6%... looking real ugly on the bigger monthly cycle. **Looks like CNBC is going all out for AAPL today... blanket coverage of the latest over priced iCrap. *notable weakness, miners, GDX -2.9%... as metals are set to resume lower. *upper bol' on the VIX daily chart is arguably important... and is offering the 17.50/18.00 zone... as early as today... but a little more viable tomorrow. 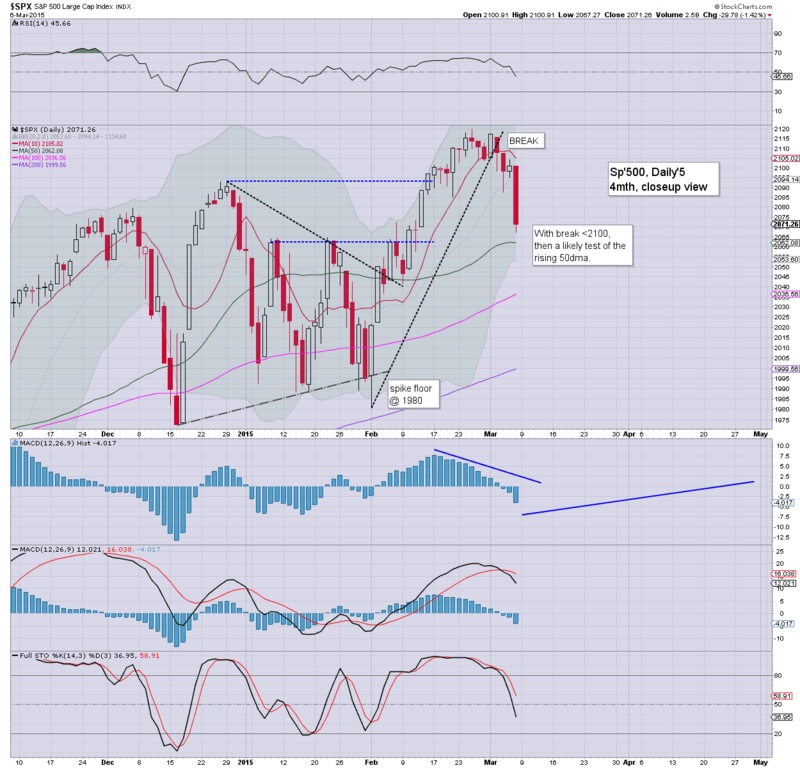 That would be suggestive the sp'2040s are 'briefly' possible.. before the broader upward trend resumes. Nasdaq is already red.... rest of the market looks set to follow. It remains possible this could all just be annoying chop for a few days. What does seem pretty safe to say... sustained trading action (as in a few daily closes) under sp'2050 looks highly unlikely. AA, -4.5%, having made a purchase. 10.44am.. well, so much for the opening reversal.. but still... new lows still seem due... whether late today.. or tomorrow. So... here we go again. A minor gain to start the week, but a net daily decline looks very viable today. In particular, a hit of the 50dma looks a given... whether today or tomorrow. I see a fair few seeking the sp'2040s before the market levels out... that looks just about possible... but with the QE-pomo train having arrived in the EU this morning.... its going to be increasingly difficult for world indexes to sell much lower. 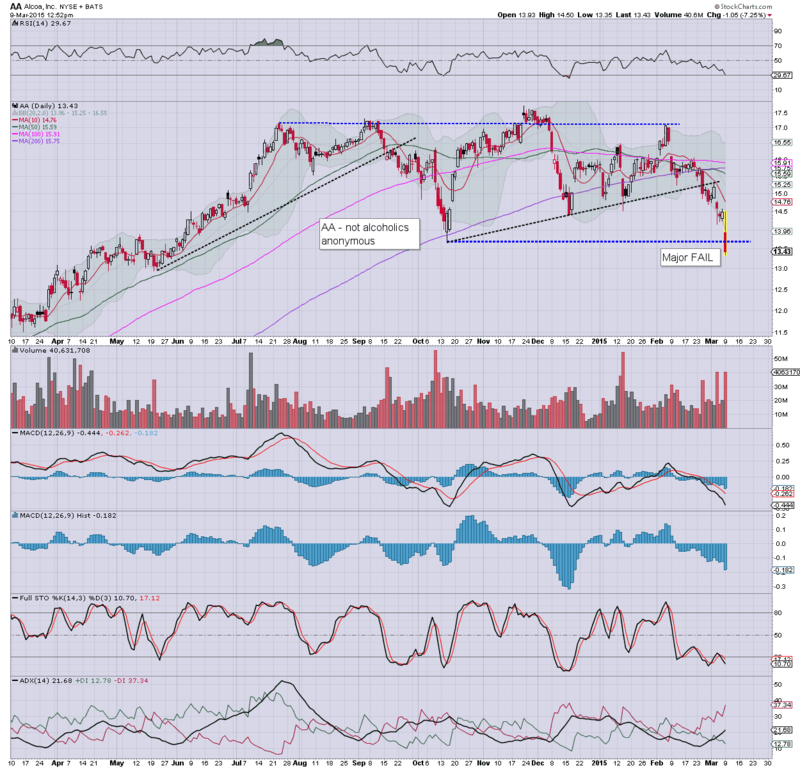 Notable weakness: AA, -3.4%... continuing to unravel... seemingly headed for $10/9 into the summer. Hunter with some doomer chat from Gold promoter Morgan. As ever... make of that what you will. I will note, it is ironic to see Morgan acknowledge Armstrong, since Armstrong would also deem Morgan nothing less than one of the crazy 'gold promoters'. 9.36am.. Indexes higher.... but so is the VIX. There is viable upside in VIX 17.50/18.00... that would likely equate to no lower than sp'2040. In any case.... market looks set to turn lower. 9.42am.. Seems to be a major sell program on energy stocks... the usual suspects... BTU, CHK, RIG, SDRL... all now significantly lower.